Jonah Lomu Rugby is a rugby union game released for the Sega Saturn exclusively in Europe, sponsored by the late New Zealand All Black player Jonah Lomu. In-game commentary is also provided by commentators Bill Beaumont and Bill McLaren. 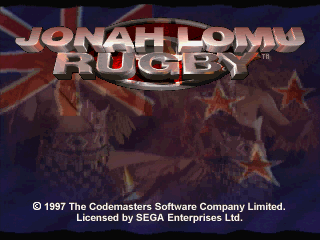 Jonah Lomu Rugby is the only rugby game for the Saturn and is loosely based on the 1995 Rugby World Cup (though lacks an official license for the event, debuted two years later and features some teams which did not qualify - an official tie in, Rugby World Cup 1995 was released by Electronic Arts for the Sega Mega Drive). Players can compete in friendlies, tournaments, a world cup, territories cups and "classic matches" based on real-life scenarios from previous World Cups. Jonah Lomu is a selectable player and is the only person who cannot be tackled, to the point where the All Blacks have a significant advantage over everyone else and are typically avoided by purists wanting a fair match. Unlike more modern interpretations of the sport, Jonah Lomu Rugby opts for a quicker-paced arcade style of play. Team Lomu is a side made up entirely of clones of Jonah Lomu. Main article: Jonah Lomu Rugby/Magazine articles.